An exploration by nine key thinkers of the popularization of elite tastes for mass audiences, High-Pop challenges the project of cultural studies to focus on all-but-ignored forms of mainstream culture. Jim Collins is Associate Professor of Film, Television, and English at the University of Notre Dame. He is the author of Uncommon Cultures: Popular Culture and Postmodernism (1989) and Architectures of Excess (1995), and co-editor of Film Theory Goes to the Movies (1993). 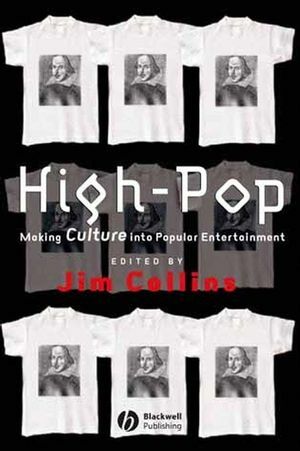 High-Pop: An Introduction: Jim Collins (University of Notre Dame). 1. "Expecting Rain": Opera as Popular Culture? John Storey (Centre for Research in Media and Cultural Studies, University of Sunderland). 2. Signature and Brand: John Frow (University of Edinburgh). 3. From Brahmin Julia to Working-Class Emeril: The Evolution of Television Cooking: Toby Miller (Tisch School of Fine Arts, NYU). 4. "Tan"talizing Others: Multicultural Anxiety and the New Orientalism: Kim Middleton Meyer (University of Notre Dame, Doctoral Candidate). 5. Class Rites in the Age of the Blockbuster: Alan Wallach (College of William and Mary). 6. Museums and Department Stores: Close Encounters: Carol Duncan (Ramapo College). 7. Which Shakespeare to Love? Film, Fidelity, and the Performance of Literature: Tim Corrigan (Temple University). 8. No (Popular) Place Like Home? Jim Collins (University of Notre Dame). 9. Style and the Perfection of Things: Celia Lury (Goldsmiths College, University of London). Takes a new direction in cultural studies by focusing on elite 'culture' as popular culture. Consists of case studies on emergent phenomena in mainstream culture that have never before been given significant scholarly treatment. Showcases work by a cast of distinguished contributors, including Toby Miller, Carol Duncan, Jim Collins, and Celia Lury.